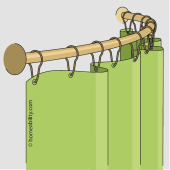 What is a Collapsible Water Dam? A collapsible water dam is a narrow, flexible strip of material that is applied along the outer edge of curbless showers to help keep the water inside and yet still allow someone using a wheeled device to easily enter and exit. 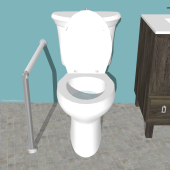 (Note that these strips are sometimes referred to as water retainers, water stoppers, shower dam, wheelchair accessible shower thresholds, or collapsible thresholds). 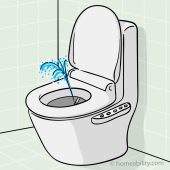 The water dam compresses when a wheeled device rolls over it, thereby permitting someone who uses a walker, wheelchair, or wheeled shower chair to enter and exit a curbless shower with ease. 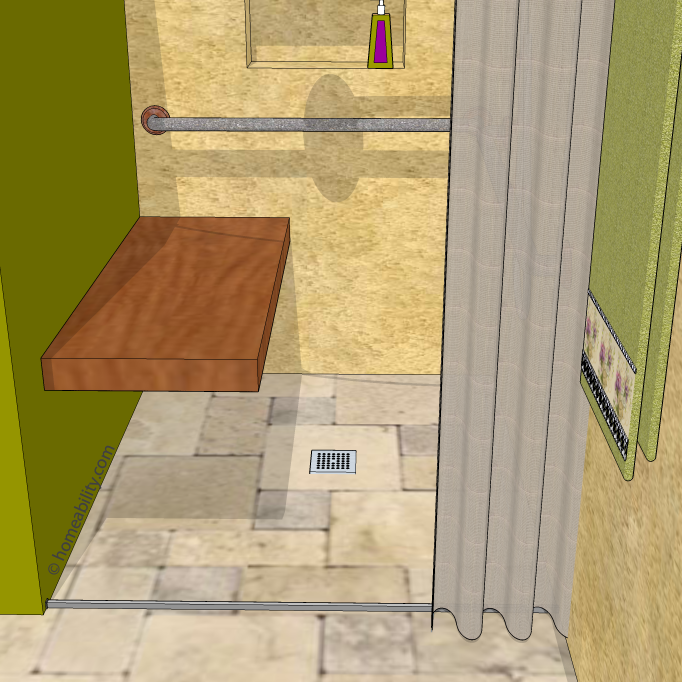 It then quickly springs back to an upright position to keep the water contained inside the shower. Water dams are easy to install. Most models require simply applying epoxy or rubber adhesive along the bottom edge of the dam and then sticking the dam to the shower floor. Some models come equipped with a self-adhesive strip, so all you need to do is cut the dam to the length you need, remove a protective strip of paper, and stick the dam in place wherever you want it. A few shower dam models require the use of screws to fix the shower dam in place. Caulk is then applied to seal the ends where the dam meets the shower wall and/or special end caps can be attached at the ends of the threshold to prevent water from leaking out at the corners. If a linear trench drain is present at the shower stall opening, the shower dam is applied along the outermost edge of the trench drain. T-Shaped Flexible Strip: These collapsible water stoppers look like an upside down “T”. The short side of the “T” is attached to the shower floor using epoxy, rubber adhesive, or self-adhesive strips and the longer side stands upright. Hollow Flexible Tube: As the name implies, these models consist of a hollow, flexible tube. They have one flat side that rests on the shower floor and are adhered in place using epoxy, rubber adhesive, or self-adhesive strips. Aluminum Threshold & Rubber Gasket:This type consists of a heavy gauge aluminum threshold with a collapsible rubber strip attached in the center. These models are typically fixed to the bathroom floor with screws. Shower dam models vary in the features they offer. Height of Shower Dams: Shower dams are available in heights ranging from 1″ to 1 3/4″. Length of Shower Dams: Collapsible rubber shower thresholds come in different lengths typically ranging from 3 to 10 feet long and can easily be cut to match the exact width of the shower entrance. Some manufacturers offer water dams for sale in long, bulk rolls for persons who will be engaged in doing multiple renovation jobs. Water Dam Materials: Models can be found made from rubber, neoprene, silicone or high density memory foam and can be used in conjunction with shower stalls that are made from acrylic, fiberglass, tile, and marble. Water Dam Colors: Shower dams can be found in white, gray, beige, light tan and dark tan. Some manufacturers will offer custom colors upon request. Water Dam End Caps: End caps can be applied at the ends of the shower dam where the threshold meets the walls to prevent the water from leaking out at the corners and to provide a more finished look. If the corner where the threshold meets the wall is a right angle, the caps can rest nestled in the corner between the wall and the floor. If there is a rounded angle, then one option is to run the flexible rubber threshold an inch or so up the wall and place the cap on the exposed end. Alternatively, some people opt to forgo the end caps and instead seal the ends of the threshold to the shower walls using silicone caulking. Collapsible water dams can be purchased independently or as part of a kit that can include any or all of the following: rubber threshold, end caps and/or epoxy glue kit. When comparing water stopper kits and prices, it is important to be aware that the kits will come with different length water dams inside. 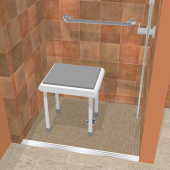 Make sure to choose a kit that contains a threshold dam in a length adequate for your shower stall. T-shaped and tube-style shower dams are both effective in retaining water inside the shower stall. The adhesive substance holding them in place can dry out over time and will periodically need to be reapplied. Shower dam models that get screwed into the shower floor are a more permanent, long-term solution. Water dams are only one means of preventing the water from escaping the confines of a curbless shower. 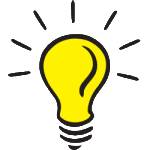 In most cases (unless the shower stall is unusually large) the water dam will not be sufficient to contain the water all by itself. Water dams work best when coupled with a long, weighted shower curtain and a shower splash guard, which helps to hold the shower curtain more flush against the sidewalls. For more tips on water retention methods, read Curbless Shower: 8 Ways to Contain the Water Inside. If you are building new or completely remodeling, we recommend installing a linear trench drain at the entrance to the shower for maximal water retention. A water dam can additionally be applied along the outer edge of the trench drain to best ensure the water will remain contained inside the shower.